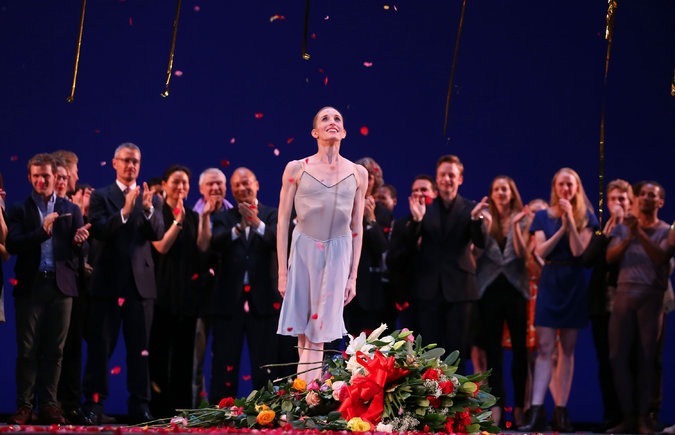 Tears, flowers and an outpouring of love accompanied Wendy Whelan's farewell performance at the New York City Ballet on Saturday, October 18. Sadly, I was not able to attend, but I heard from friends and balletomanes that it was an awesome night, the kind that brought a community of uber devoted ballet fans, long-time lovers of the NYCB, Whelan aficionados, critics and some lucky few, unaware of the occasion, but happy to have landed there, to Lincoln Center that evening. Many of us would call the NYCB the greatest ballet company in the world, and, so, we collectively mourn the loss of its reining queen. One of the works Wendy performed that evening was the pas de deux from After the Rain with Craig Hall, choreographed by Christopher Wheeldon in 2005 to a stunning musical score by Estonian composer Arvo Pärt. I was lucky to have caught a performance of this magical piece the week before Wendy's farewell program. Wendy and Craig's rendition that evening was heart-stopping. I don't think I breathed for the duration of the ballet, and I certainly shed many tears. The pas de deux begins with Wendy standing diagonally downstage from Craig. Wearing a pale pink leotard and skin-toned ballet slippers, Wendy's legs are bare and her long blonde hair is down. Craig, bare-chested, wears a simple pair of white trousers. An achingly beautiful theme for one piano and one violin ensues. It starts with three simple notes on the piano, followed by a long wail of the violin. This musical mantra repeats like a lullaby through the pas de deux. The choreography brings the partners together as she falls into him, expressing an implicit, unbreakable trust. And then she pulls away, arching and extending, but bringing him along as he is never far from her in this lyrical pas de deux. While they appear youthful and in love, there is something solemn and forlorn in their relationship. This complexity creates the tension, the nuanced texture that makes this not only great, but brilliant choreography. Wheeldon choreographed After the Rain on Wendy and former principal dancer Jock Soto in 2005. Since then, it has been performed by many--most notably for me, by NYCB principals Maria Kowroski and Ask la Cour in a film version on a rooftop, overlooking Ground Zero. Director Davi Russo made the film at dawn on September 12, 2013, on the occasion of the 12th anniversary of the terrorist attacks of 9/11. The film was gifted to the city by the NYCB. Fittingly, it is called New Beginnings. Ballets are defined by those who dance them, and each dancer's interpretation makes a lasting imprint. Choreography shown in a different setting, danced by other performers, keeps it alive and renews the work time after time. In this dramatic context with One World Trade Tower as a backdrop, we ache with memory and mourn for those who perished. Filmed at sunrise, against this landscape of sadness, the ballet takes on new meanings of redemption and rebirth. Rather than the silence at the New York State Theater that diffuses the house as we wait for Wendy and Craig to begin, the filmed rooftop rendition of the pas de deux begins with the sound of the wind blowing, as Maria's hair flutters across her shoulders. The sun is rising, but the sky is still dark, with only hints of pink streaks that will wash across New York's skyline moments later. And then the dance begins. We came here to dance, it is what we do, but our hearts are breaking and it is simply not possible for us to perform this evening. But we will be back tomorrow, and we will be honored to perform for you then.